SW Limousine provides professional ground transportation to and from all International and private airports within Phoenix, Scottsdale and other local cities. Get up to the minute flight tracking information and more. 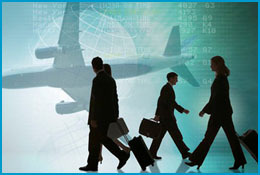 For businesses that have frequent travelers we offer Corporate Accounts. From conventions and meetings to airport transfers, SW Limousine is Phoenix & Scottsdale’s choice for corporate ground transportation.